BERR seem to be systematically delaying, and/or knowingly providing false and misleading information in response to FoI requests. It would seem BERR have a crystal ball. I received a letter from Stephen Carter offering an explanation for the inconsistencies in the timing of events in April and July (see earlier posts). 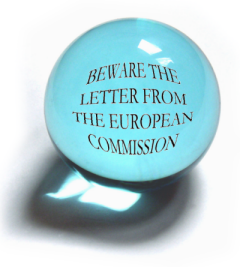 Supposedly, three months before any letter was received from the European Commission, BERR claim they were so concerned about the Phorm system (and trials in 2006, and 2007), they were preparing to respond to an enquiry from the European Commission. This concern was shared with Tim O'Sullivan (Director Public Affairs) at British Telecom on 2 April 2008. "My officials advise me that this was a particularly active subject at the time, as BERR and the Ministry of Justice were negotiating and arranging which Department should lead generally over various pieces of correspondence and workstreams, including FoIA requests, that had already been received by them or were known to be likely to become active areas of work on this subject over the next few months. One topic highlighted was arranging the drafting of the UK Government's reply to the Commission - should it see fit to send a letter to the UK Government. Therefore, it seemed sensible to clear the lines of responsibility on such matters as early as possible. Such a letter was received by the Department in July." Despite this remarkable prognostication, BERR were unable to comply with the deadline set by the European Commission in June, and the reply BERR sent was subsequently rejected. His letter also contradicts earlier FoI requests; I was told that "The first contact made by British Telecom ... to BERR to discuss the proposed use of Phorm products for internet advertising occurred on 17 April 2008". A position repeated in this third party FoI request. But apparently BERR, BT and MoJ were already discussing Phorm by email on 2 April 2008 (see email between David Hendon and Tim O'Sullivan below). Put simply, it would seem someone in BERR is being economical with the actualité. "David I know you spoke to ? earlier today on this and mentioned that ? is taking the official lead now you have resolved the ministry of justice issue". I wrote to BERR with a FoI request. I wanted to know what the MoJ issue was and how it was resolved. You can see BERR's response below. "arranging the agreement between BERR and the Ministry of Justice as to which department would lead on drafting and submitting the response to the European Commission to ensure a full and prompt response would be received". Here's where that story falls apart; the European Commission did not write to the UK Government until 30 June 2008. The letter reached the Cabinet Office in July. Hence, the 'MoJ' issue referred to by Tim O'Sullivan in April (three months earlier) could not have been the European Commission letter. It hadn't been written, never mind delivered to the UK Government. Scanned documents from the BERR FoI response to a request for documents and correspondence.